A little Glam a day keeps the rain clouds away! A happy late New Year, lovelies! The holidays may be over and done with, but the glamour never has to end. This week on the blog, we're showing you some of our favorite looks to maybe help inspire you for your next big event, or even if you don't have anything coming up, there's no harm in treating yourself to a new look! Rose gold everything please! We are loving this stunning combo of rose gold eye shadow and wine red liquid lipstick. The best part of this look is that these pinks complement practically any skin tone! Arie'l Who? There's a new mermaid princess in the sea, and she's sporting a shimmering teal shadow that's got prince Eric doing double takes! Don't be afraid to stray away from your neutral pallets and try out a pop of color that will really brighten your eyes. I have a feeling you won't regret it! Not into the bolder looks? Need a look that you can easily wear to the office, but once office hours are over you're headed straight for the dance floor and just need to change out your lipstick? 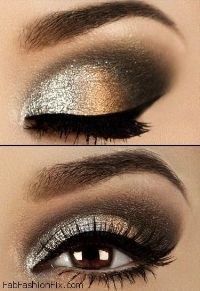 Try out this softer, yet still totally glam look! It'll get you all the way through the day and straight into the night! Ultra Violet is the PANTONE color of 2018 and we are here for it! Not only can we wear all of our violets and lavenders, but we can incorporate them into our makeup routine as well! 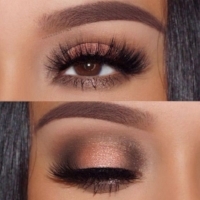 This look is perfect for a night out with all of your best girlfriends! You can never go wrong with bold and gold. Gold and neutrals are the perfect classic go to, and we can see why! These colors compliment every eye color and skin tone,and creates a stunning dramatic look. Absolutely obsessed with one of these looks? Or do you maybe have something a little different in mind? Either way, call us up at Blowtique and we will lend you a helping brush! We would love to see your bright and beautiful faces! Thanks for checking in on us this week, lovelies! Your support means the absolute world to us!